Designed for staining, hybridization, washing, etc. 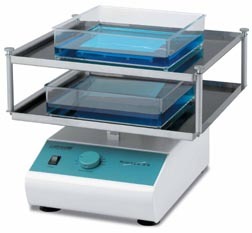 The Labnet Economy Rockers, ProBlot 25 and 25XL, are basic rocking platforms that have been designed for a long life and trouble-free service Rocker speed is adjustable to provide the gentle motion required for staining fragile gels as well as the more vigorous action necessary for washing blots. The rocking movement is fixed at ±7º. The platform surfaces are covered with nonslip rubber pads to prevent objects from moving during operation. Elastic tie downs are available to secure in place bags, boxes, tubes and other containers. The platform assemblies pivot on permanently lubricated ball bearings for quiet, maintenance-free operation. The ProBlot 25 platform measures 28.9 x 20.3 cm, while the ProBlot 25XL platform is slightly larger at 30 x 30 cm. For increasing the work area without sacrificing valuable bench space, a second platform can be stacked on the first. The ProBlot 25 and 25XL Rockers can be used safely in temperature controlled environments up to 85°C. Their low profile and compact size make them perfect for use in small incubators.